The Patel Conservatory is pleased to announce a special guest for this year’s Spotlight Awards. Joshua Grosso, winner of the national 2012 Jimmy Award for best actor, will perform at next week’s Spotlight Awards. Last year, Grosso represented the Straz Center, and the state of Florida, at the National High School Musical Theater Awards in New York City. More than 50,000 high school thespians competed in regionals across the country. Grosso, of Plantation, Fla., earned a spot among the top 60 most talented performers who qualified to compete in New York through the Straz Center's Broadway Star of the Future Award. The prestigious New York competition was featured last year in a PBS documentary called Broadway or Bust, which aired recently in the Tampa area. As the Jimmy winner, Grosso received a $10,000 scholarship. 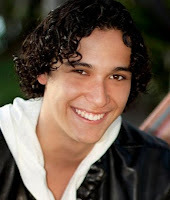 He is currently a sophomore studying musical theater at Carnegie Mellon University’s School of Drama. Don’t miss your opportunity to see this award-winning performer and rising Broadway star at the third annual Spotlight Awards, which will be Thurs., May 23, 2013 at 6:30 p.m.
Tickets are $20 through May 16. For tickets, please call 813-229-STAR (7827) or visit www.strazcenter.org or in person at our box office.